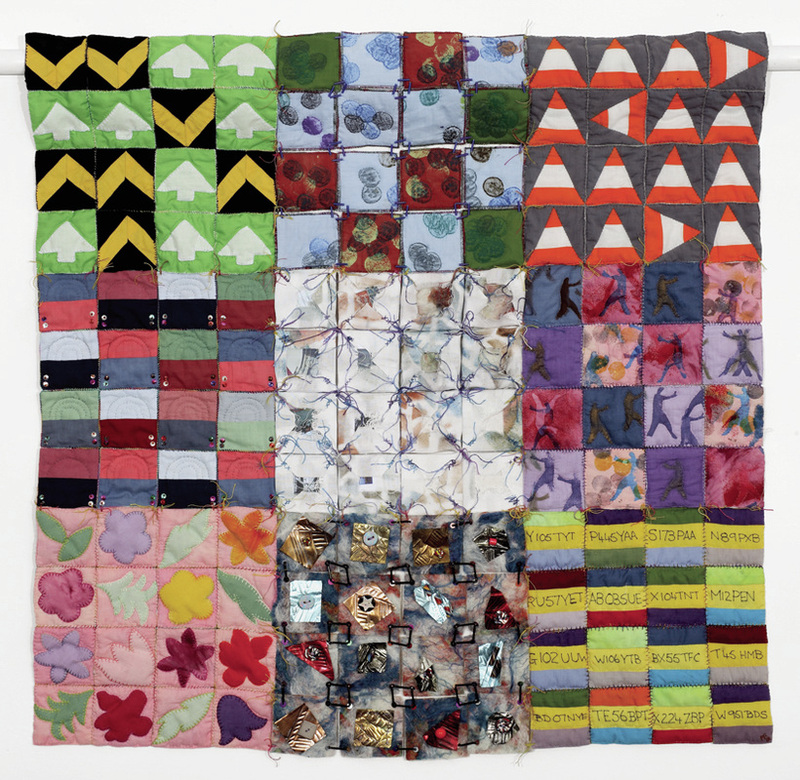 By Design is a group of eleven leading textile artists from the South of England, brought together to form an impressive exhibition group. All the members are well known artists in their own right, who work individually to create their own pieces of quilt art. This is our third exhibition, Passage Defined, a new series of 22 textile hangings. We have chosen to explore the concept of the word ‘Passage’, which is rich with meaning and associations. Each person in the group has started with two pieces from the same design source. One piece has been completed by the original artist, with the second piece being worked on by three other colleagues from the group. From the quilts themselves we can see the progression of ideas as each artist adds their own interpretation of the theme. The result is an exciting exhibition of thought provoking hangings, which explore the theme within a broad spectrum. I used predominantly my own hand-painted fabric with some hand dyed fabric from Heidi Stoll-Weber. I made stencils and stamps for the wall decorations to use with fabric paint. These were put onto organza to give a ghost like appearance. I transferred a drawing of an Indian dancer on to organza for the front wall of the dwelling to give the effect of a shadow left by the dancers of the past. 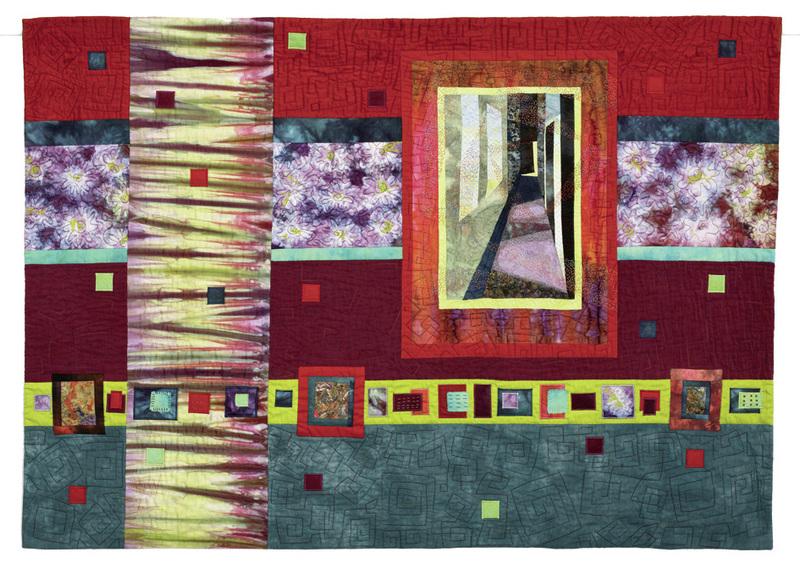 I used fusible web to fuse images or fabric on to the work. 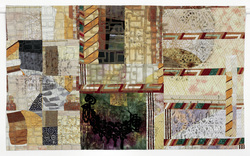 The piece was machine quilted and embellished with rayon and cotton threads. Lynne: The word Anasazi in some languages means ‘Ancient Ones’ and refers to the ancient civilisation that lived in the Mesa Verde area of Colorado and New Mexico. The Anasazi suddenly disappeared from the area in the 1300s, and no one knows why. I used images of the pottery, wallpaintings and carvings that they left behind. The starter piece was one half of a T-shaped doorway, showing two interior rooms. Christine: I thought I was expected to cut the piece up, but I realised I wanted to make it bigger – so I added another doorway in similar, related colours to act as a sort of echo. I cut this in two and added it on both sides of the original piece. Grace: Taking inspiration from the Anasazi pottery, I chose a zig zag design. This design I sun-printed, painted, stamped with petroglyph designs and inserted diagonally into the piece. 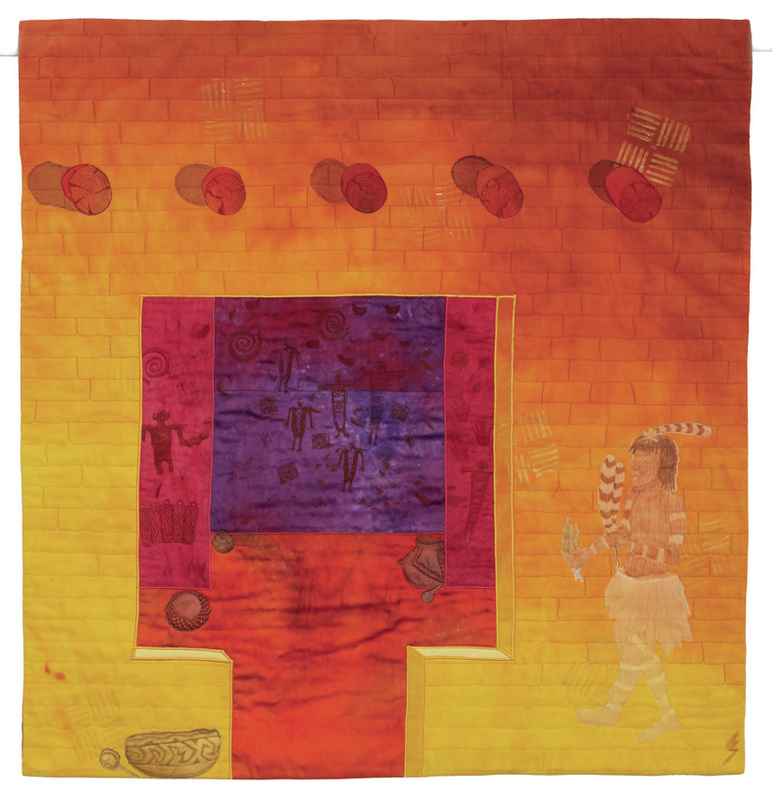 Susan: I silk-screened a piece of my own dyed fabric and placed it asymmetrically on the borders. Lynne: When I received the work, the basic structure was so beautiful that I just needed some stitching and some images to finish it. I stitched some crystal organza onto the diagonal zig-zagsand added images printed onto Lutrador® and organza. 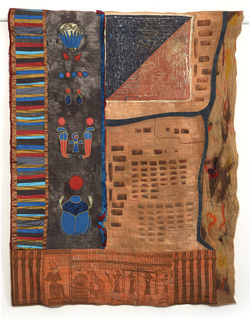 Then I machine stitched more motifs from Anasazi wall art, using multicoloured rayon thread, over the whole piece. I wanted to use individual squares, building into larger blocks, then fastened to each other in a building process. 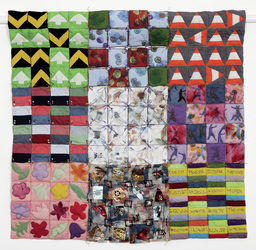 Each block of squares represents part of the Dartford Tunnel process, from the land before it was started to the signage and number plates of the vehicles now journeying through it. I added metals and beads for further interest. Sway Arts. I am intrigued by old maps that are drawn on paper with high fabric content. 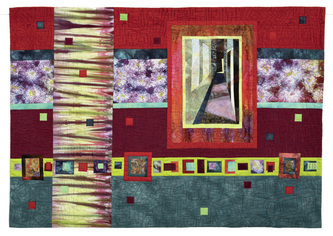 I liked the idea of using the English paper piecing method as a bridge between the times. I only ‘tacked’ at the corners and wanted my threads to show. I used home made paper and felt to give extra texture and interest. making it appear as a section of road. the many cables and pylons overhead at the entrance and exit. Christine I followed on with traffic lights. square that I had started with. I added the arc shapes to represent the inner workings of the tunnel during construction with the rivet holes. 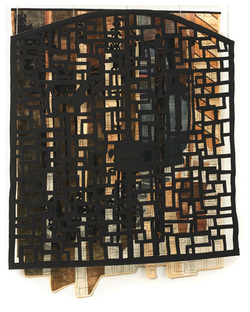 I enlarged the starting point by adding a hand dyed piece of fabric and applied, in black fabric, a gate. The result was not what I expected it to be, so I cut it in strips and re-assembled them. 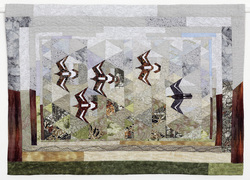 It was pieced and quilted with a pattern of a modern gate from another photograph. To take the theme of looking through even further, I made a separate gate of double backed black fabric and that is hung slightly suspended in front of the main piece. Grace: The theme brought up ideas of architecture that I had already played around with. I used photographs taken on a trip to Budapest in Oct 2005. I began with a small section of a photograph showing archways and pillars. I used mostly hand dyed fabrics. Susan: I deliberated long and hard and computer designed. I enlarged the starting point by adding extra wall blocks on the left hand side in similar colours. side, thinking of a warm country perhaps and imagining my piece to be around another corner. piece, and the perspective was wrong. I swapped left to right and vice versa and added an extra pillar to balance it out and a bit of pavement. Grace: When it came back to me it looked quite bland. I inserted some pieces that I had made with the roof tile colours and patterns, and stencilled with a pattern of the original old gate, appliquéd pieces of the old gate, markalled and used the modern gate and the roof tiles as a quilting pattern. Only the words ‘for a moment in time’ appear on the starter pieces. 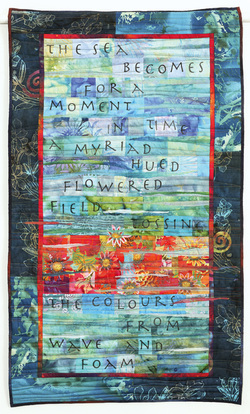 The complete verse is revealed in my own quilt. I used sea coloured fabrics, printed with lettering straight from the printer on to the fabric. These were overlaid with sheer fabrics and painted Stitch & Tear, followed by the bonded flowers. Machine quilted. Beverley: I chose part of a poem by Gwen Hicks as my starting point. Gwen is in her eighties and lived on the Isle of Wight for some time. She wrote the poem while watching the colourful yachts racing off Cowes. 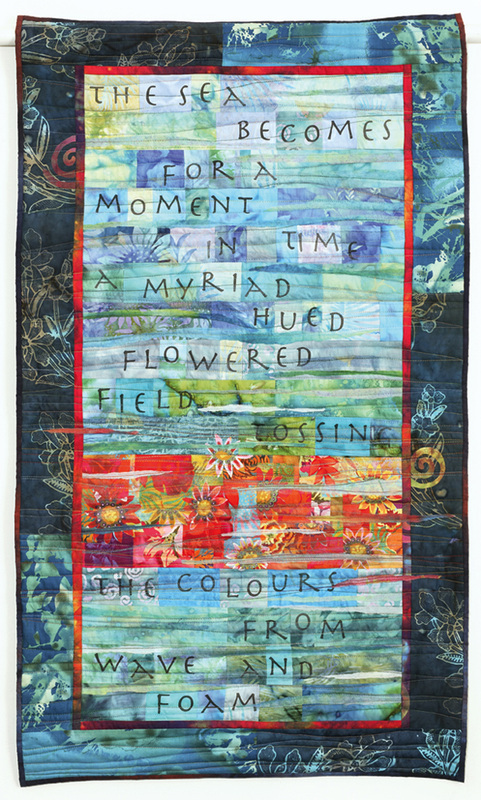 Janet: I love the colours of this piece but I find words on art distracting, so I cut them up and rearranged them, adding some ‘passages’ of dyed lace. Hilary: I feel it is my mission in life to add some larger pieces to Beverley’s work.The Japanese writing was a desperate afterthought to try and add interest. June: This piece stayed on my design wall for a very long time. I needed to work out how to pull everything together. Rearranging the Japanese pieces and adding plain strips to the central shape seemed to work. contributor, the overall feeling that I got was rather negative. There was no added colour and no contrast. The piece was very blue, so in my usual style I chopped it up into strips and added strips of yellow, orange, red and terracotta. Semi sheer fabric, with names of foreign cities printed on it, was laid on each blue strip and the piece was quilted by machine. It reminded me of the old destination boards at London railway stations when I was a child, thus the name. While walking along our local beach, we saw some turnstones with a follower, which we later identified as a purple sandpiper. My quilt focuses on the birds flying along the shore. I included the wooden posts to give some depth. I tried to use colour to suggest the winter skies, the salt marsh plants, and the patterns of sand and mud beside the sea. Most of the quilting is by machine, with hand stitching in thick threads to suggest the textures of grass and ripples in the sand. Mary: I was inspired by the coastline between Lymington and Keyhaven, a large area of salt marsh looking towards the Isle of Wight. In winter, the creeks and lagoons are full of migrant birds who have left the chilly north for the slightly softer south. I love watching the flocks of turnstones, which hunt for food in the shingle, and designed a block based on their winter plumage when in flight. Hilary: The turnstones really impressed me and I felt I needed to add something coastal. I live near Chichester harbour where thousands of Brent geese come to winter. I added the dramatic flying geese wheeling in the sky. June: I added even more geese, this time stencilled with oil bars, and some more coastal colours. only add a border on two sides to add a sense of boundary. sides. Faced with some challenging piecing, I started to fill in the gaps in the background. Then I felt it needed to stay an irregular, although smoother, shape, so I continued the borders in Beverley’s style. There was still one missing corner and my husband suggested the Mariner’s Compass. The hand and machine quilting adds texture and even more birds, perhaps lapwing and dunlin. This started with a large piece of fabric. I wanted to contrast the beauty of the French Quarter in New Orleans with the lower lying, poorer areas. Houses here are submerged, communications broken. The sky is clear and blue. A modified Rita’s Whirlie made the hurricane and crazy piecing the broken township washed into a corner. 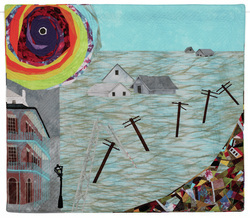 Hilary: My inspiration came from Hurricane Katrina. The news was dominated by the human tragedies occurring as a result of hurricanes. More people were dying and being made homeless. The passage of these storms has changed peoples lives, for some of them in a direction they would never have imagined. Yet the world lurches on in its suicidal blinkered attitude to global warming. I pole-wrapped and dyed fabric, using several dye baths to give a water effect. I added a broken radio mast and some telegraph poles. suitable for families to return to. It will be several years before everyone will be able to return. Many families are now settled elsewhere and will not return to New Orleans. Is this the end of a great city? the colours from a geological heat map and the Fibonacci sequence, I cut it up and rearranged it with the strongest colours of the eye of the storm staying closest to the centre of the piece. I felt the resulting piece was much stronger, reflecting the nature of the subject. 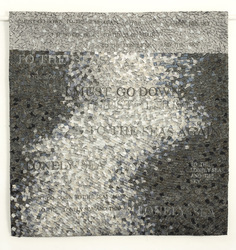 Lyn: I was taken aback when I received the piece as it had changed dramatically. After many thoughts, I decided to add strength and directional arrows of the wind, indicating the spiral into the eye of the storm. Hilary: I was delighted with the results. All I needed to do was add a strong border but decided to stencil people on the outside of the arrows. 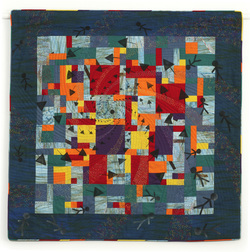 The quilting follows spiral lines. My own piece was based on a passage of music. 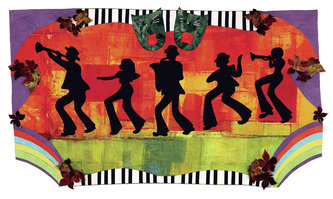 Having been to New Orleans for my 40th birthday (a long time ago) I was very taken with the processions of jazz musicians constantly parading through the streets of the French quarter ... some behind funeral corteges but many just for the joy of making music ... so my piece tries to reflect that exuberance, the flowers were hanging everywhere from the balconies as you look up, on every street corner and even around the horses ears that pull the carriages around the city. stave of music in bright colours, arched like a rainbow ... I then scattered music notes on it and passed it to ‘the team’. 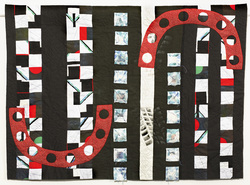 by applying black shiny keys onto white fabric and then arranged the rainbow strips onto it. trips to New Orleans I had made over the years. The image that stuck with me was of the railings on the balconies in the French Quarter - they werelike lace made out of iron. I researched photos of these balconies, andthen designed railings onto white fabric, which were then fused into place. 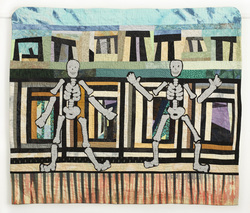 These made the top part of the piece look like the music was coming out of unseen doors and windows onto the balcony. Grace: Although the purple was overpowering I did not want to cut it even more. 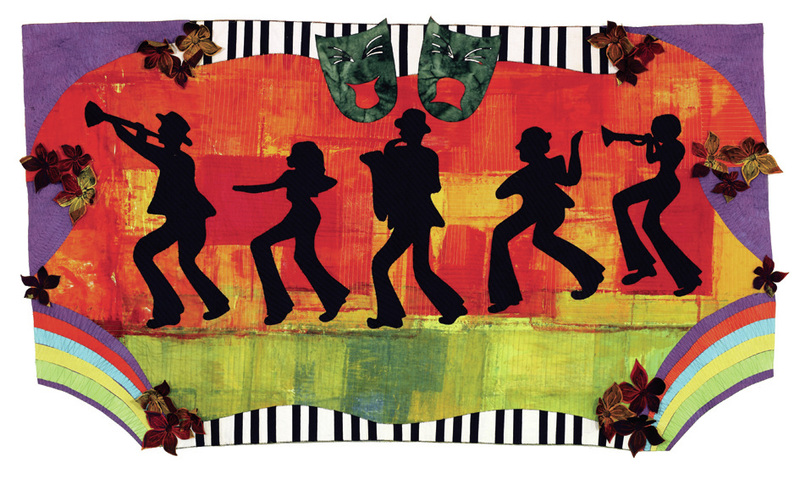 I used a jazz image from a jazz festival enlarged it and applied it in black fabric over the notes, rainbow et al. architecture and I was really pleased with it. I quilted the piece quite intensively and am very pleased with the end result. I kept my starting block in one piece I added the slightly open door to add a bit of mystery but I had no particular idea as to how to finish it. I decided to show off some of my hand dyed fabrics and turn them into an over-sized frame for the feature block. The picture theme continued with the small rectangular shapes in the lower third with random squares dotted around the rest. The machine quilting in a square spiral shape covers most of the area with a hand stitched design based on the Newgrange roof patterns over the main block. particularly taken by a photograph of the servants’ passageway at Calke Abbey and the Megalithic Passage Tombs of Newgrange, Knowth, Ireland. I was trying to get a feeling of depth to my starting block but didn’t have a finished design at the time I handed over my piece. Beverley: I looked at passage tombs, which reminded me of Log Cabin Patchwork. I had just finished reading’ Labyrinth’ by Kate Mosse, a story of the Knights Templar and tombs discovered Centuries later. I cut up the original blockand made the lareg log cabin ‘passages’ in the centre of the piece. represents a disturbing incident on my local beach where a man collapsed with a heart attack and died. Penny: It Looked out of proportion so I wanted to add to the bottom. Having tried variations of blocks I completely changed direction. I took inspiration from a painting by Edward Burro of ‘Skeletons at a Party’ and added the two bony figures, having fun dancing outside their burial chamber. dyed some fabric and it came out perfectly. It reminded my of the gas fires we had when I was a child. The sky was an old piece of damask tablecloth, dyed years ago. The piece was not square and did not lend itself to being straightened so I decided to leave it as a random shape. 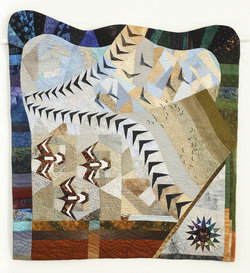 The spiral machine quilting represents heat and smoke. The photograph dictated for me the colours of the desert and I added turquoise and gold to show the riches that accompanied the Pharoah. 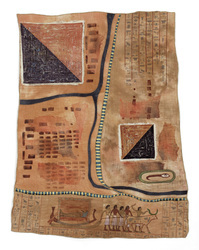 The boat carrying the mummified body is shown being pulled towards the canals that were dug from the river Nile. For the Pyramids, I layered and slashed, leaving strands of gold and turquoise to indicate the wealth hidden within. Markall stencilling and painted images complete the story. building of the Pyramids taking many years. in the 1970s and I used some of the jewellery from his tomb for inspiration. I chose bright silk fabrics and gold thread to echo their richness. Christine: I loved the piece, and didn’t want to disturb anything, so I decided to add a border to echo the Pharonic themes, choosing an inlaid stone design from one of the tombs and making a strip of coloured silks to add on the left side. Hilary: I looked for something appropriate and in a library book I found a Ptolemaic papyrus of the weighing of souls, a stage in the passage of souls into the afterlife. The fabric was cyano printed (using a computer prepared negative) and tea dyed and then dyed with procion. There are forty two deities in the judgement hall and the deceased is female with a feather for a brain (obviously a blond). The ‘Great Eater’ is on the throne. June: I completed the piece by adding a border of felt on one side. My thought was that both pieces would appear as relics and to that end the edges are uneven and finished with hemp string. Disaster struck when I had nearly finished. The turquoise marker pen I had used on the stitch and tear was not permanent and bled into the painting and eventually the whole quilt. I had to scrap the whole thing and start again! This time I used permanent marker! I outlined each pillar, roof, floor and ruin etc. with satin stitch after which I painted the details on to the fabric with fabric inks and outlined the bricks with a fine ink marker pen. The buildings were joined to the mountains. 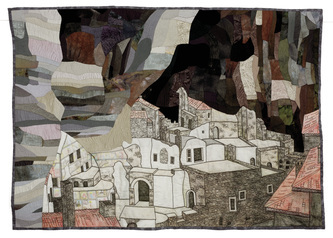 The heavy quilting shows the strata of the rocks and the old bricks. being ordained!) in particular, spirits, prayer flags and monasteries. I had visited a monastery in Trabazon, Turkey, which was high up in the mountains set in a sheer rock face and this inspired my piece. I made a section of the rock face. Penny: I added the silk Lotus Blossoms as these figure very strongly in the religion of the area that was depicted. Buddha and the Lotus are closely linked. Having researched into this aspect I wanted to incorporate fuchsia coloured lotus flowers into the piece. fissure or crevasse. I did a lot of research on Tibet and Nepal and thoughts of architecture came to mind, but decided to leave that to the next person. Lynne must have read my thoughts! to sections on the left hand side. Lyn: I was delighted with it. I took off the two organza printed monastery pieces, cut out the monasteries and re-applied them. Any excess fabrics were cut into shreds and machined down to emulate the lake in front of one of the monasteries. I cut into the back of some of the mountains and stuffed them adding another dimension. I added a lot of stitches and knots to add different textures and also did a lot of machine quilting. 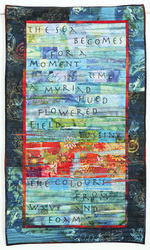 At the bottom edge I inserted lengths of wool to emulate the prayer flags fluttering in the wind. I cut up all the silk, and lots more, into tiny squares, and bonded these on to a foundation to make quite a large impressionistic misty grey seascape ( I have used this method several times before to get rich monochrome effects). Then I printed the piece with words from the first two lines of Masefield’s poem ‘Sea Fever’, using a thermofax screen. Finally, I quilted it using swirly parallel lines. furthest point North known to the ancient world, called Thule. My idea centres around the ultimate (northern) destination, the furthest point you reach in time, place, or life. I made simple strips of several grey silk colours to start things off. 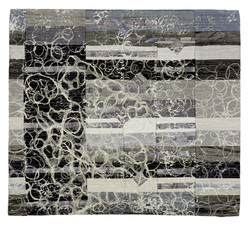 June: I thought the strips asked to be broken up to reflect the sea’s movement, so I Markel-stencilled wave patterns on more grey silk and inserted pieces of these into the original, and I also added some navy silk for width. Lyn: I finally decided to add foam ripples as in the photos of the wake. So I cut scrim and manipulated it with PVA glue, and couched it down. Janet: I enjoyed making a further strip, which I just pinned to the piece so that Christine could decide exactly where to place it. she had suggested), and then the ripples extended with machine embroidery, to show the seas in the ship’s wake.